Did they talk to each other before the conference, I wonder, or was it pure serendipity that their concerns for the future of networked learning seem to be similar? Sian’s argument is that we need to get away from the idea that the architecture of a university is the authentic space making distance education a less authentic space. She said that sedentarism is still driving universities. She first wrote about smooth and striated space way back in 2004, basing that paper on the ideas of Deleuze and Guattari (1988) about the limiting effects of hierarchical, striated spaces (see list of references). However smooth spaces are not necessarily utopias, as Frances Bell, Mariana Funes and I found in some recent research. But notions of smooth and striated space are useful for thinking about how we might need to reconsider learning spaces. Is a MOOC a smooth or a striated space? 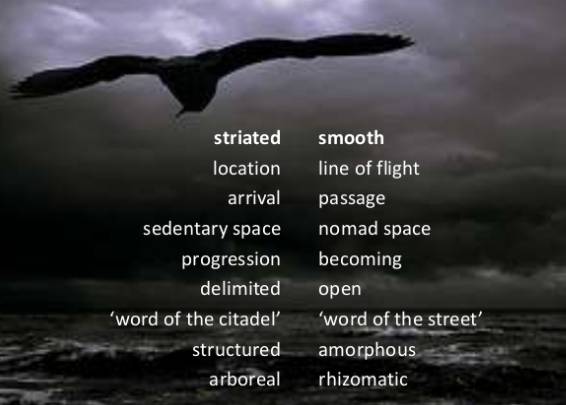 Is a conference a smooth or a striated space? Sian then went on to talk about bounded, networked and fluid space and the permeability of boundaries. All these spaces are important. She told us that distance students can have ‘campus envy’, i.e. they believe that the on campus students get a better deal, that the face-to-face bounded experience is somehow more authentic, which is not necessarily the case. The grass is not necessarily greener on the other side and absence can make the heart grow fonder, but her students think of the campus as ‘home’. My experience is that meeting face-to-face in a physical space adds value to connection, so I think I understand where Sian’s students are coming from. Bounded space, networked space and fluid space are all defined by the relative stability of their boundaries and the relationship between elements. Unlike Etienne Wenger’s work on landscapes of practice and the importance of boundary crossing , Sian asked us to consider space in Mol and Law’s terms (1994) – as being fluid, that is, the boundaries are not permanent. I particularly liked the notion of ‘fire space’ – here but not here, presence and absence. I am now thinking about this in terms of Absent Presence, which I have blogged about before. Absent presence in online interaction. Sian’s argument is that we should offer students topological multiplicity. All these spaces are important. This resonates with my own research using the footprints of emergence, where we argue that prescribed learning spaces are no less important than emergent learning spaces. The need for each and the balance between the two will be determined by the context. Finally Sian talked about code/space. I suspect that this is where her current research interests lie, whereas mine remain in the effects on identity and becoming of the multiplicity of spaces available to learners. But I was intrigued by the idea of code/space. Ideas of space, becoming, disconnection, connection, metaphor, code, algorithms, collective well-being and different ways of knowing were threads running throughout the conference. It will be interesting to see if they are followed through in the next conference in Zagreb, Croatia, 2018, and how much our thinking and ideas will have moved on. I will be following Sian and her team’s research to see how these ideas about space for becoming develop. Bayne, S., Gallagher, M.S. & Lamb, J. (2013). Being ‘at’ university: the social topologies of distance students. Higher Education 67(5): 569-583. Bayne S. (2004) Smoothness and Striation in Digital Learning Spaces. E-Learning. 1(2): 302-316. Carvalho, L., Goodyear, P. and de Laat, M. (eds) (2017) Place-based Spaces for Networked Learning. Abingdon: Routledge. Deleuze, G. & Guattari, F. (1988) A Thousand Plateaus: capitalism and schizophrenia. London: Continuum. Dodge, M. and Kitchin, R. (2005) Code and the transduction of space. Annals of the Association of American Geographers, 95(1), 2005, pp. 162–180. Hannam, K., Sheller, M. & Urry, J. (2006). Editorial: mobilities, immobilities and moorings. Mobilities, 1(1), 1-22. Kitchin, R. and Dodge, M. (2011) Code/Space: Software and Everyday Life. Cambridge, MA. : MIT Press. Knox, J. (2016) Posthumanism and the MOOC: Contaminating the Subject of Global Education. Abingdon: Routledge. Law, J. & Mol, A. (2001). Situating technoscience: an inquiry into spatialities. Environment and Planning D. (19), 609-621. Mackenzie, A. (2002) Transductions: Bodies and machines at speed. London: Continuum Press. Mol, A. & Law, J. (1994). Regions, networks and fluids: anaemia and social topology. Social Studies of Science, 24(4), 641-671. Sheller, M. & Urry, J. (2006). The new mobilities paradigm. Environment and Planning A, 38, 207-226. Thanks Jenny – you are on fire yourself this week, with all the great posts you have written and shared. 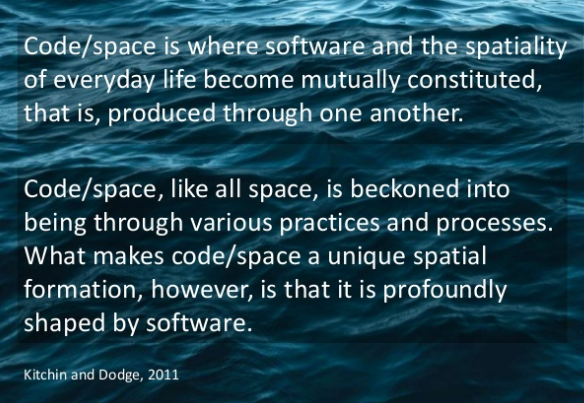 I have thought a great deal about space in the last couple of years, and I am sympathetic to the idea of topological multiplicity in code spaces and non-code spaces. Living together in these multiple spaces gives opportunities for fun and presents challenges for living together. Thanks for helping me think about the challenges. “The immediacy of online response makes these relationships “interactionally present” (Knorr-Cetina & Bruegger, 2002, p. 910). This provides a “virtual immediacy and shared interactional space” (p. 914), which can be equal to, or even more engaging and intersubjective than face-to-face interaction, because of the richness and diversity of participants that can be brought together in a single integrated, hyper-linked conversation. “And Bayne (2009, p. … ), in another context – the virtual world of 2ndLife – reports that many students who close down their 2ndLife Avatars at the end of a university course grieve, and experience the loss and even death of their Avatar as a death of a part of themselves. There are two issues for me, the first is the one that you raised so pertinently in the work we did on MOOCs (and later on Footprints of Emergence), namely the centrality of space for silent contemplation (and you have added to here as well). That was crucial to ‘filling out the gaps’ in the frameworks we have been developing over the years. Michael Harris’s work takes it one step further, in describing a world characterised by the ‘absence of lack’ (or as one might better say, the ‘denial of lack’). Once you get into that cycle of immediacy, denial of lack becomes a way of life (or psychic death). and … the second issue is the one of multiplicity of code/space – or softly structured agency. But that depends on how ‘soft’ the software is. ‘Soft’ as in pliable, reprogrammable, reusable, hackable, not ‘soft’ as in either ‘just comfortable’ or as in ‘soft’ as in ‘soft power’ – power which is deceptively gentle. And certainly not ‘soft’ as in ‘too soft to hear the real intent’ – as in ‘free’ software that entices you in to the parlour, only to commoditise you, cut ‘you’ up into data derivatives, and distribute you in pieces, and sell you on to ‘intelligence’ and commercial agents. Hi Jenny, I’m a Connectivist/Networked Learning PhD student in London – an interested ‘lurker’ on your blog! I have been on a quest for a first-hand cMOOC experience which I have yet to enjoy. The nearest to becoming a ‘networked learner’ was a great email exchange with Dave Cormier in January with high hopes of him running #Rhizo16, but no news since then [sad face]. With the current shortage of cMOOCs, and the ability for students like me to easily become involved, I wonder what the future holds for Siemens’ and Downes’ vision of accessible education…. It feels a bit ‘chicken and egg’ – relatively few connectivist practitioners to convene cMOOCs = no critical mass yet = limited research opportunities to support the practitioner community. For now, I have benefited from the rich insights from the research that you, Frances Bell and Rita Kop et al, have given us on the ‘ideals and reality’ of the early cMOOC pilots. The ability to experience this form of networking for myself is my next ambition towards my research writing. If you can advise me of any opportunities to hop on-board a cMOOC any time soon, I would appreciate it. Hi Frances and Roy – thanks for your comments and for the references, ideas and links. Lots of food for further thought. I have been wondering what the implications of topological multiplicity are for identity and what the role of self-imposed disconnection might be in helping people manage this multiplicity. Hi Alison – thanks for your comments. It’s interesting that you are keen to experience a ‘c’ MOOC. These days ‘cMOOC’ can be interpreted in many ways, with even some Coursera MOOCs considering themselves cMOOCs, e.g. EDCMOOC (the one taught by Sian Bayne and her team) and ModPo, taught by Al Filreis and his team from the University of Pennsylvania. I tend to think of MOOCs as being on a continuum from xMOOCs to cMOOCs with many hybrid versions in between. But I think you are looking for a cMOOC more on the cMOOC end of this spectrum and maybe on the extreme ‘c’ end. #rhizo16 fits this bill and my understanding is that it is due to start again anytime now – maybe in a week’s time? To be sure you would need to follow the #rhizo16 hashtag on Twitter. There’s probably a Facebook group as well. Since cMOOCs are by definition distributed, then information about them is likely to be on Twitter, Facebook or Google+. They might also be in other locations, but if you start with Twitter that will probably lead you to other sites. Thanks for this and other NLC posts Jenny, and also the many links provided. I read your piece about the rhizome as problematic metaphor with interest! 1. The tricky space is between heterotopias and fractured narratives. 2. ‘Belief’ (e.g. that Obama’s birth certificate was forged) is inversely related to the intelligence of the believer, and directly related to the number of followers you can hustle up (I use the phrase advisedly) on social media. Click bait just reminds me only of the putrid stuff I used to put on a hook to catch fish. 3. Coded space has to be interrogated as an array of affordances. Like all affordances, they are there to be exploited, hacked, developed, re-created … for good or evil. However, all software is in one sense just another semiotic difference machine. It creates and separates variables into sets and hierarchies, and links them in chains and loops of consequences. All very nice. However, like syllogisms, logic, argument, belief (see above for it’s modern version), and financial derivatives, … as soon as you combine sub-programmes into more and more elaborate programmes, it all becomes fuzzy, then greyed out, then plain inaccessible. To put it simply, ‘logic’, ‘argument’ (and social and financial policy), whether in written text or code-text, take on a life of their own, retreat from the public view, disappear up their own derivatives, and provide the ‘surplus value accumulation machines’ of big capital, big date, big ‘men’ (yeah, lots of patriarchy tangled up in this), and ‘big countries’ (e.g. Putin on horseback). Leo – thanks for your comment and further advice for Alison. Hi Roy – another set of great comments. Very thought provoking. Thanks. I can see how you are linking Sian’s ideas with your own recently published paper – http://www.tandfonline.com/doi/abs/10.1080/17467586.2015.1065074?journalCode=rdac20 . I like the idea of the tricky space being between heterotopias and fractured narratives. I found quite a lot of enthusiasm for the Internet or even Internet cafes being heterotopias (I wasn’t convinced), and the idea of a narrative being fractured sounds like disconnective practice, and being, at least in part, off the network. I think that the code space is about a lot more than software – and lashups or assemblages work for me to think about all the people and stuff that get bound and discarded over time. I find it helpful to think about the layers of codings that take place with numerous assumptions being coded in at each stage and becoming ever more inscrutable to use Edwards term and somehow less separate. Buried deep in an offering that is being sold will be the work of many whose contributions are glossed over in the cause of novelty claims and profit. Thanks for your comment Frances. Your reference to Richard Edwards reminded me of this list of publications on the Code Acts in Education website, which you have probably seen, but maybe Roy hasn’t. Lots in there to add to this discussion. I found that via another route – it’s amazing isn’t it? Thanks for the reply and further links Jenny, will follow those up.